Dr. Laura Markham is a clinical psychologist specializing in child development and parenting. The founder of AhaParenting.com, she supports parents every day in her private coaching practice and daily email inspirations. She lives in New York City with her husband and their two teenage children. "Dr. Laura is always tuned in to what kids need so they can thrive, and what moms and dads need so they can parent well. If you want to feel more confident and peaceful as a parent, this is the book. Dr. Laura helps you understand what drives your child's behavior, and gives you the practical tools to change it." 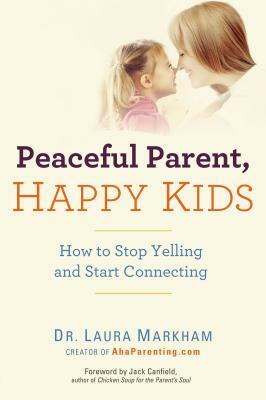 “If you want to declare peace in your home, follow Dr. Laura Markham's original and authentic advice. With her emphasis on taking responsibility for our own emotional states as parents and connecting rather than controlling, Dr. Laura offers us suggestions that help us to create strong relationships with our children. If we all followed Dr. Laura's advice, we would indeed change the world." "Dr. Laura shows parents how their empathy can wire their child's brain for emotional regulation and happiness -- and a brighter future for humanity. Her understanding and knowledge of the many challenges of raising loving, compassionate children gives parents powerful tools to be the best that they can be. A simple, yet revolutionary, message of love."